A recent analysis of well-preserved jaws shows that hominids have been using toothpicks for a long time. A really long time. The jaws, or mandibles, were discovered in the Dmanisi Republic of Georgia, and they belong to the earliest proto-humans to ever venture outside of Africa. They're now referred to as Homo erectus georgicus, and they're believed to be a subspecies of Homo erectus and not a separate species of Homo. Their brains were slightly smaller than ours and they walked upright. They also used tools. After studying four different Dmanisi hominid mandibles, a team of archaeologists led by Ani Margvelashvili from the University of Zurich noted a considerable amount of variation between individuals — differences in shape that couldn't really be explained by normal genetic variations. 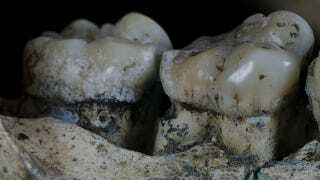 Rather, the malformations and wear on the teeth were likely caused by tool use, including toothpicks. And in fact, some Dmanisi hominids used toothpicks so much that they developed periodontitis, which would have been characterized by infected and swollen gums. The person who was using the toothpick was young, as his or her teeth were not worn down. The researchers also discovered a damaged area between the teeth and the gum, featuring a small cylinder-shaped lesion that could easily be pierced by a toothpick. "Progressive tooth wear triggers bone remodelling processes that substantially modify the shape of the jaw during an individual's lifetime," Margvelashvili told the BBC. "These effects are typically underestimated when attributing fossil hominid jaws to different species." Interestingly, one of the four jaws was so worn that the individual had lost all teeth except one canine tooth. The researchers suspect that this hominid may have been able to survive by using tools to prepare soft food. Read the entire study at PNAS: "Tooth wear and dentoalveolar remodeling are key factors of morphological variation in the Dmanisi mandibles."